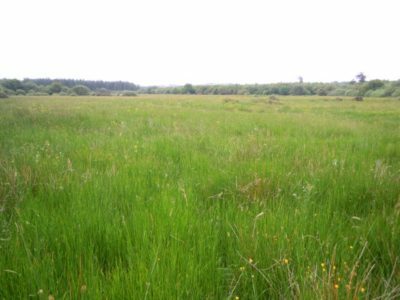 Wet grassland is a habitat that forms on flat or sloping ground on wet or waterlogged soils that are poorly drained or subject to seasonal or periodic flooding. Wet grassland often contains abundant rushes and grasses such as Yorkshire Fog, Creeping Bent and Marsh Foxtail. Wet grassland is distinguished from marsh when the grass, sedge and rush component is greater than 50% of the vegetation cover. This habitat was formerly widespread in lowland meadows that flooded in the winter. River drainage and embankment has severely disrupted and in many cases eliminated the wetland nature of floodplains and this has led to the disappearance of wet grassland meadows. Wet grassland can be recreated even on a small scale by blocking drainage channels. Wet grassland can be maintained by ensuring that the site is wet for at least part of the year. Grazing can help to control encroachment by willows. Wet grassland is an important habitat for a range of grass species such as Rough Meadow-grass and Tufted Hair-grass that have become increasingly scarce in modern farmland. A range of herbs such as Creeping Buttercup, Marsh Thistle, Silverweed and Meadowsweet frequently occur in the habitat and Cuckooflower or Lady’s Smock, the foodplant of the Orange-tip Butterfly is often common. Several bird species such as Lapwing, Curlew and Snipe feed in wet grassland.